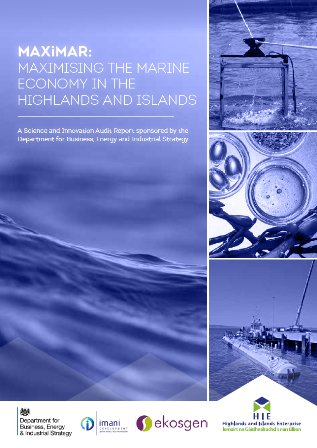 The ‘Maximising the Marine Economy in the Highlands and Islands’ (MAXiMAR) study focuses on supporting the growth of aquaculture, energy and marine biotechnology which are the most highly innovative sectors. Highlands and Islands Enterprise (HIE) led the wide-ranging consortium to conduct the study which is known as a science and innovation audit’ (SIA) and is part of a UK Government sponsored series of audits to determine place-based specialisation. In addition to HIE, the other organisations in the consortium are: the University of the Highlands and Islands, Scottish Aquaculture Innovation Centre, Industrial Biotechnology Innovation Centre, the European Marine Energy Centre (EMEC), the University of Stirling, Heriot Watt University, Wave Energy Scotland, Marine Scotland Science, MASTS and the National Oceanography Centre. A key element will be a pilot test site to explore the potential to cluster marine economy activity across the sectors for example use of drones and robotics. The report highlights that although the sectors will grow at different rates, evidence points to a total value of the marine economy in Scotland of £5bn by 2035. “MAXiMAR provides a fantastic, positive view of the potential growth of the region’s marine resource as an economic driver. Our lochs, rivers and coastal waters constitute a tremendously valuable asset that already makes a massive contribution to the regional economy and has the potential to achieve even more. “Sectors as diverse as food and drink, tourism, life sciences and renewable energy are well established, supporting thousands of jobs, many of them in fragile areas of our islands and rural mainland. “The audit gives us a definitive assessment of the extent to which businesses and communities are using our marine resource, and assesses the scope for further development to drive economic growth across the region. The marine project is one of 12 UK science and innovation audits which were first announced in 2015 commissioned by the UK Government’s Department of Business, Energy and Industrial Strategy (BEIS) in 2015.